Artificial Trees - Are You Having a Laugh? Comment on this story on your local forum. A consortium of London Councils including Hounslow, Ealing, Hammersmith and Fulham and Wandsworth are planning to cut costs by switching to the use of artificial trees. The plan envisages that as trees on local streets die they will be replaced with sophisticated carbon fibre replicas which would be virtually indistinguishable from the real thing. The consortium believe that this will provide massive budget savings on maintenance and reduce the need to replace paving stones cracked by root growths. Problems caused by falling leaves in the autumn such as blocked drains and people slipping on wet leaves will be a thing of the past. They expect residents to be pleased as the new trees will reduce the risk of subsidence for houses with trees in the road outside - and sticky deposits from lime trees have been a problem for people parked underneath them. 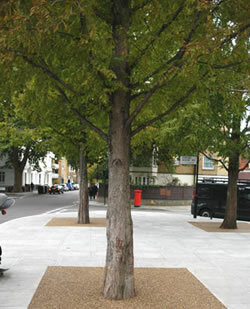 The new trees will come in a range of traditional British species and will allow the re-introduction of the elm onto London's streets. They will be preprogammed to 'shed' their leaves in Autumn and 'blossom' in the spring. It is estimated that it will take around fifteen years for the existing tree stock to be replaced. The consortium has given reassurances that no healthy tree will be cut down unless it is financially advantageous for them to do so. Spokesperson for the consortium, Avril Amadan said, "Many of our residents are already recognising the environmental benefits of switching from a real tree to an artifical Christmas tree and we are simply following the logic of this idea. Trees are costly to the taxpayer and bad for the planet and we are providing a 21st century alternative "
The move is likely to be resisted by environmental groups concerned about the loss of the capacity of trees to absorb carbon dioxide. Green lobbying organisation 'Friends Of Our Locality' have produced a study that shows that the switch to artificial trees will actually reduce carbon emissions - the need to pollard growing trees and sweep leaves creates more CO2 than the plants absorb they claim. The hi-tech trees will also be able to contain extra equipment such as traffic monitoring cameras and display panels for the Councils to republish information from their magazines and newspapers. As the trees will be hollow, the larger varieties may provide a workspace for local monitoring officers. Ealing Council is proposing setting up a unit called Ealing Local Volunteer Executives. These E.L.V.Es would reside in the trees to report breaches of parking and refuse disposal regulations by local residents.